My Desire: I want to interact socially appropriately/effectively/pleasantly with my friends and acquaintences (I want to say with integrity that, "I am doing great", even if A truth is that I am having a very unusually chaotic/challenging day." My Belief: (My Story) I am doing great + (Their Story--from personal need to move on and cultural traditions around stewardship) I want you to tell me your doing great....I'll say the same about how I am doing." My Desire: I want to relax AND I want to do it the easy way (out of a bottle), like taking a pill, opening a kit. My Belief: (My Story) Aveeno Lotion helps me feel calm and relaxed + (Their Story--from the back of the bottle) "This unique lotion helps to calm and relax you as you message it into your skin..."
My Evidence: The bottle says it will. Plus it has lavender, chmomile and ylang-ylang in it. "I am quickly becoming Aveeno’s fan. I talked about this before as well here. I love the fact that they use natural ingredients such as soy, oats, feverfew, wheat complex, and so on. The thing that caught my attention on this product was the stress relief part. The product is made with lavender, chamomile, and y-lang y-lang. These ingredients can provide a calming and relaxing experience. The instructions say to apply this moisturizing lotion right after shower to feel relaxed and calm or anytime you want. I feel like it works best after you take a long hot bath. The smell is not overpowering at all. It is quiet faint and lingers around you. First time I used it, was when I took a hot shower. I applied this all over my body and I felt like I was meditating in a beautiful secluded mountain. Ok, that is overstating! But, it really felt good. And, the lotion is very moisturizing. It leaves the skin very soft. 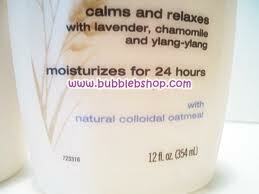 It states that it moisturizes for 24 hours, I believe it. The product cost $10 for 18 fl. Oz. That is a great price."